Is a negative ion generator what you need? We've all seen commercials on TV for ion air purifiers. They are advertized with names like Ionic Pro or Breeze. They usually stress that there is no filter to replace. Keep reading to find out what an ionic air purifier does. How Does an Ionic Air Purifier Work? An air ionizer uses electricity to charge air molecules. This creates ions. Most room ionizers you can buy create negative ions. An ion is a molecule with a charge. An ion air purifier produces a negatively charged ion. We often hear these machines called a negative ion generator. You can read more about negative ions here. The theory is that the charged air molecule will touch a particle of dust, or something else, giving it a charge too. These particles then act like a magnet. Two like charges push each other away. Two opposite charges attract each other. Now that we've got a bunch of charged particles, What happens next? The particles stick to something solid like a wall, ceiling, or furniture. Some people report everything in their house being covered in a fine dust. This dust can then be cleaned up. Why not use a filter so you don't have to sweep and mop up the dust each day. Some air cleaners contain metal plates for the particles to stick to. These will collect the particles and keep them trapped. The plates have to be washed regularly. The more stuff on the plates, the less effectively they work. The particles will also stick to each other. As more and more particles stick together They too heavy to keep floating and they sink to the floor. Depending on the company, ionic air purifiers are marketed in two different ways. The first way is that they don't need a fan. The machine produces negative ions. These ions then drift all through the room. As they come into contact with particles, they stick to the particles and then to a wall. We feel that even with this model a fan is needed to get the ions to circulate around the room. The other kind of machines use a fan. They have collector plates inside. First the particles are charged and then they are attracted to the oppositely charged plates. We feel this kind of air purifier is better, but it still has some problems. The collector plates have to be regularly cleaned. The more dust that builds up on the plates, the less effective the purifier is. They do have the advantage of never needing to be replaced. We think these kinds of purifiers have some drawbacks. The particles removed from the air get stuck to walls, furniture, and floors. If they are not cleaned up, they can get stirred back into the air again. A lot of these models do not have a fan. Without a fan there is not enough air moving through the machine. The air can't get cleaned. is these particles are stuck around the room. They could come loose again and get back into the air. Of course, the obvious solution is to combine ionizers with another type of filters. An air purifier with an ionizer is safe to use. It's safe as long as it doesn't produce excess ozone. Too much ozone has been linked to health problems in some studies. What About Ionizers and Asthma? Ionizer don't really help asthma suffers. 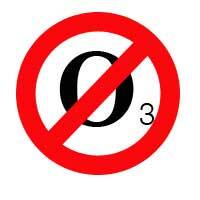 A purifier that doesn't release ozone won't hurt someone with asthma. Not sure which air purifier to buy. Here are some different ionic air purifiers. Some of these are only ionizers. Others use a combination of filters. Some are room ioniziers. Others are personal ionizers. These ion air purifiers don't use any other kinds of filters. 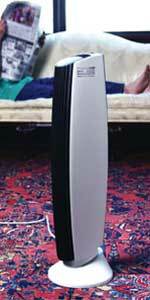 This kind of ion air purifier use other filtering methods, like HEPA filters, with an ionizer. BlueAir makes a very good combination air purifier.